Want to Sponsor One of Our Animals? Have a favorite animal at the sanctuary? Did Sweetie the spider monkey capture your heart, or perhaps Lola the ocelot? Or maybe you're just particularly fond of howler monkeys, or maybe peccaries! 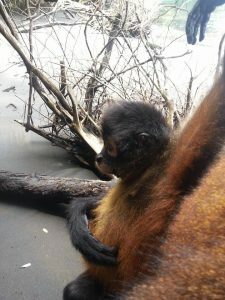 Or perhaps someone you know loves capuchin monkeys, and you would love to buy them a sponsorship of one of our resident capuchins. If so, our "Sponsor an Animal" option helps you help us by supporting one of our many resident animals. This support option is still very much in the works, but we are constantly working on smoothing out our ideas and putting together a comprehensive program that leaves you feeling closer to our animals. If you have any ideas as to what you would like to see included in a sponsorship package, we would love to hear any of your ideas while we iron out the details. In the meantime, thank you so much for considering sponsoring one of our animals, we--and the animals--really appreciate the thought!